Introduction: Some of this information may change over time, as the Arena and its tenants fine-tune the facility and its offerings. Please feel free to leave additional information in the comments section. Some policies might also be subject to change–or I could just be wrong. Please keep that in mind, as well. The purpose here is to provide as much information as we can to arena-goers so that each may maximize his/her experience at the facility. I find the resources available regarding most such facilities (arenas as well as ballparks and so on) are sorely lacking. 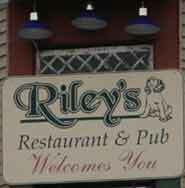 It’s a great place–just trying to help you appreciate it to its fullest! I’ve personally attended all but four Phantoms games, every SteelHawks game, several concerts, and a couple other events at the arena. 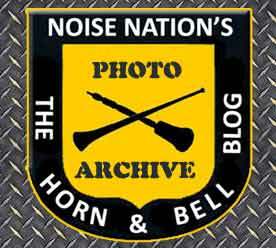 This post is based on my experiences, and those of my friends and fellow fans. We’ll update periodically. The Arena is located at 7th Street and Hamilton Street in the heart of downtown Allentown. 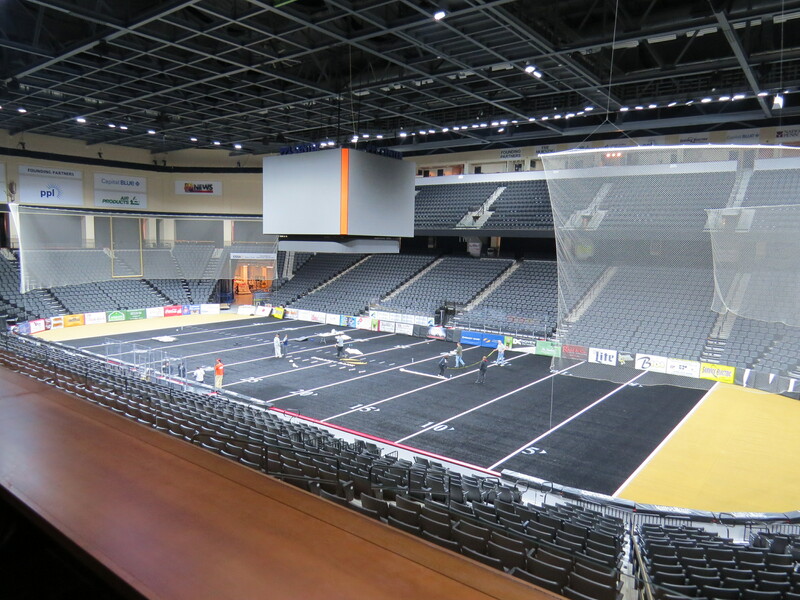 It is a true “downtown” arena–and that was kind of the idea at its genesis. However, please do not put “701 Hamilton Street” in your GPS for the trip. You’ll want to plan your parking first–and use that address as well as advanced route, for GPS directions. Advanced: Many of the streets surrounding the arena are one-way. Parking is “multi-site.” Planning your parking and entry route into the city will help prevent you from driving around, looking for parking. The streets surrounding the arena are well-lit, and security is ubiquitous at this juncture. It’s safe to park and walk. 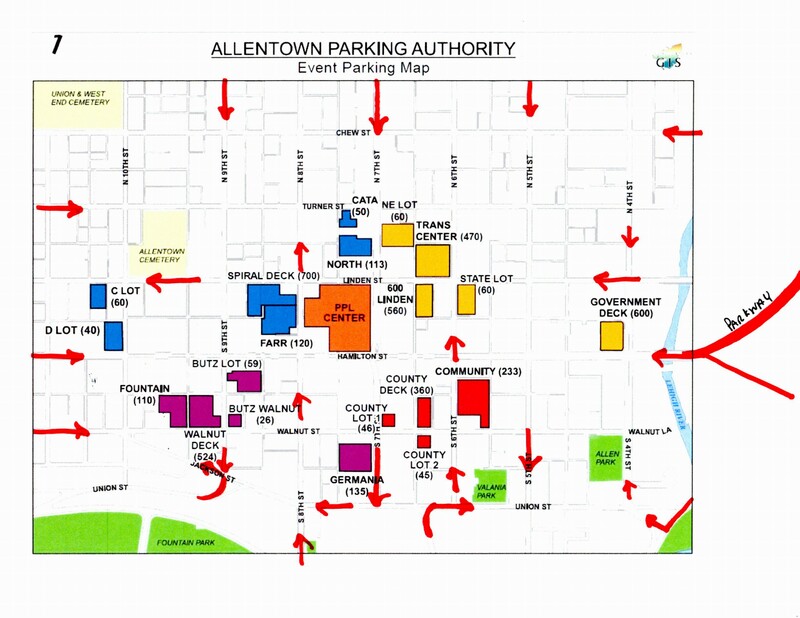 You may have the opportunity to pre-purchase parking through the PPLCenter web site (for the arena garage via Linden Street) or through the Allentown Parking Authority (for the “Spiral” and “Community” decks) via their website. However, it’s not usually necessary to pre-purchase parking as it’s never totally run out. The advantage would be if you absolutely know you want to park in one of those particular decks, or if you might not have cash because sometimes their credit card system is down. 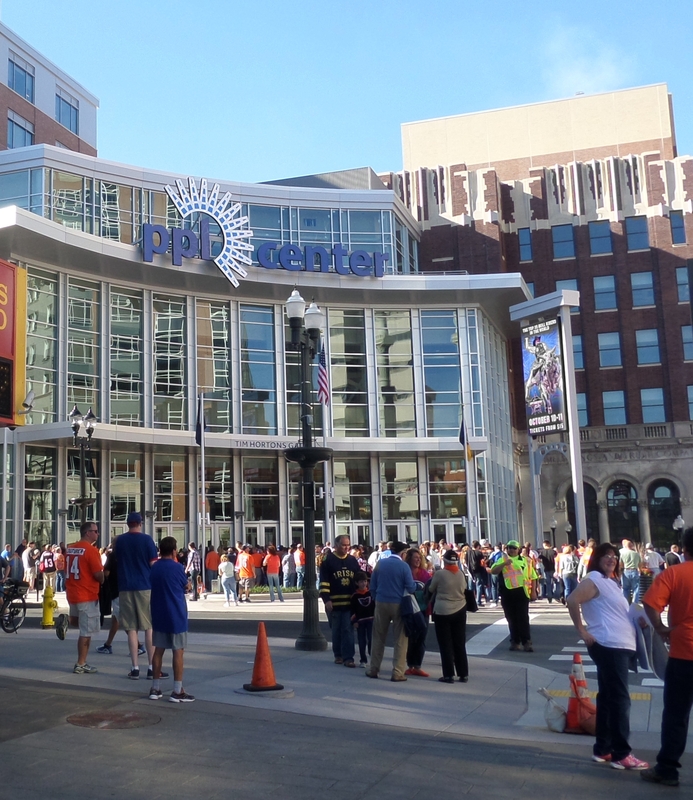 While some who may live in Allentown may be able to walk or use public transportation to attend events at the PPL Center arena, most of us will have to arrive by private vehicle–and park. Parking is $6 for sporting events and $10 for other events such as concerts. It’s not clear where that line is drawn–but parking can be paid by cash or credit card on access to the parking garages and surface lots in the area. I altered the map below to try to show the routes into and out of the arena zone. Advanced Parking, volume 1: Note the color coded parking choices. As you enter the zone, you’ll see color coded signage which will direct you to parking. Follow @AtownParking for up-to-the-minute parking information on Twitter. (Do Not Tweet and Drive!) Be careful about my out-dated maps, too, because some decks are being added, and other lots are disappearing, as downtown development rolls on. Advanced Parking, volume 2: This is the paragraph about on-street parking. Unfortunately, the Parking Authority has altered things so that this is no longer a particularly viable option. Meter parking within the “arena zone”–Hamilton and the cross streets for one block between like 4th Street and 10th street–are now double the rate, and all meters are checked all the way until 10PM. The Parking Authority made this change to drive more downtown parking into the lots and decks; thus, street parking is no longer a realistic option for arena events. EXCEPT, you can now “feed” the meter via the MobileNOW! app–which might work from inside the area or the restaurant. Click the QR on you meter and away you go! Also, they don’t check the meters on Sundays, last time I checked. Advanced Parking, volume 3: There are a couple things to avoid. First, avoid Linden Street as much as you can. It is the busiest street east to west, and construction at 6th street and traffic at 7th street and pedestrians on an event night slows things down. Second, do not attempt to park in the Arena Garages unless you’ve already pre-purchased a pass. If you do have a pass, it is for the Linden Street entrance and not the 8th Street entrance. Finally, avoid driving around in circles if you can help it; it just adds to the traffic. Park and walk, if you can. Advanced Parking, volume 4: Handicap and Accessible parking options may still be a problem. From what I’ve heard so far, parking via the Linden Street Arena Parking (pass only) entrance and taking the elevator directly to the concourse behind section 107 works very well. However, as mentioned above, you must have a pass ahead of time for this. It may be available to you when you purchase your tickets, or contact the arena to ask about accessible parking; call if you have to. Most lots and decks have designated spaces–and there might be shuttles to help–but that may not be an appropriate option for everybody depending on individual limitations. Perhaps a call to the Parking Authority in advance can provide further information about your parking needs also, if the arena staff are of no assistance. I also saw a couple street spots empty the other day along 7th Street, just South of the arena, but unfortunately the new meter rules may prevent those from being usable spots for area events. Advanced Parking, volume 5: If you’re headed downtown early to grab a bite at one of the nearby restaurants, you may be able to take advantage of valet parking. I believe the Cosmopolitan, ROAR Social, Dime and the Hamilton Kitchen offer this service for $20 (plus tip?). It’s not a way to save money, but does add a modicum of convenience for a night out on the town. If you’re a guest at the hotel (Renaissance) then you’ll have parking in the arena garage. But, it’ll cost you $12 or $24. Also, I worry that getting the car and getting out of there could be a problem when everyone is leaving at once. Sure, you’ll get it eventually, but you might be there waiting at the valet station for some time–in the cold–while they bring it. My parking post is here. There are some new additions via the “Park Free” initiative set forth by the downtown merchants. PPL Center patrons who are spending some time downtown anyway can get parking validated or even reimbursed. Plus it lowers the cost of the valet. Check it out. Seating Charts: I’ll add them at the bottom; please scroll down. I’ll try to add appropriate charts for hockey, football, basketball, and concerts. 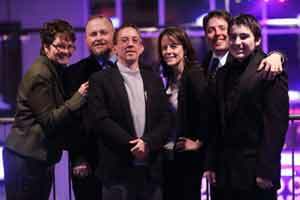 Check the PPL Center website for your event for a more specific chart. There are approximately 21 rows in the lower bowl, and 14 in the upper. Some sections may vary based on arena structure. The first rows of the sections in the lower bowl are on collapsible risers–depending on the event and the setup, “row 6” or “row 7” –or some other row–might be the front row. The last rows may include accessible areas and support stanchions, so seat numbering may not match the row in front of it. Extra rows of folding-chair-style seats are added where the hockey benches usually are–for basketball, concerts and the like. There are bar-chair/rail seats at the western end of the arena in the final row. They have numbers, but I’m not sure if they are sold or are for general use–it may depend on the event. There are general admission use areas at the far western end of the arena, as well as near the bar behind section 107, and in the Miller Lite Loft in the upper Southeast corner, access via the stairs to section 210 and 211. Some of the general areas will be blocked for group areas staring in the 2015-2016 hockey season. General Admission tickets for hockey are usually available ONLY after all of the seats have sold out. Some of the “SRO” or General Admission tickets have a location, like “West” or “Miller Lite Loft.” I don’t think you’re restricted to those areas, but they want to kind of direct folks to where there might be room set aside for them to stand. All of the seats in the arena are nicely padded and are very comfortable–if a bit small. Seats in the upper and lower bowl are slightly smaller than the seats in the “club” sections. Those seats are, in turn, slightly smaller than the suite seats. Finally, the largest most comfortable seats seem to be the ones in the “Loge” boxes. If you have difficulty with heights, you may want to decline an invitation to the “level 4” suites; they do sit high above the arena floor and in some cases the view feels almost straight down. However, you could always stay back in the boxed area and enjoy the catering! The seats in the front 5-7 rows for hockey that are on collapsible risers differ somewhat in that they seem to be just a hair smaller, and the cup holders are on the short, folding arms (rendering them practically useless, but…). If your seats are set up on other risers, on the floor, or in other make-shift areas, they will be folding-chair-style seats which are nicely padded, but small and possibly locked together (closely!). One more note on the seating charts: Over a year into it now, and I’ve seen MANY different variations. My advice is to take the time to click the button for seating chart as you are purchasing your event tickets for the arena on their website. Advanced: Because the arena is not huge, there’s really not a bad seat in the place, and you’re never too far from the action. The seating in the upper bowl for concerts will cause you to have to look and turn to the right. In some areas, you’ll have to peer through a railing, a stairway in use, and a piece of Plexiglas. This is not always the best view. Also, sound damping has been added to the metal roof in many areas, improving the sound for concerts. However, above the upper bowl–as well as above the upper suites I think–there is none. The sound is a little echo-y up there. Sound down on the floor for concerts has been superb thus far. But remember, while the floor seats are nicely padded, they are very close together and locked via “tongue and groove.” Also, keep in mind when selecting floor seating for concerts that many (most?) people will want to stand the whole time, regardless. Advanced: The restrooms on the main concourse on the North side of the arena are the most crowded. This has been a problem at times–particularly during concerts. Check the other restroom locations to avoid the longer lines. As I mentioned above, use the stairway for section(s) 211/210 to access the Miller Lite Loft. Just keep going up until you reach a concourse area above the upper bowl. There will be a bar to your right, and an open area to your left–probably will be used for group functions eventually. As far as I could tell, there are no restrooms in the loft! Don’t drink too much up there or you won’t be able to get down all those stairs! For men, the rest room with the shortest line is usually the one behind section 119, followed by the one behind section 102. Concessions and Team Shops: The main team shop is in an area on the East end of the arena that I refer to as the “rotunda.” The store is not terribly large, and they limit access to it to only a few people at a time. Plan on standing in line to get in. Phantoms season ticket holders receive a 15% discount on gear–but you must ask for it and have your season ticket available for inspection. There is another area near the main gate and Tim Horton’s, which is open during business hours. Use the far left-hand door for access. There is a third, very small area near the 8th Street gate which has children’s items. 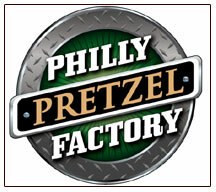 Chef Express: Wraps and Salads, soft pretzels and popcorn. Grill Master: Grilled fare, including chicken, and Hot Dogs; arena favorites. Chickie’s and Pete’s: Crab House and Bar. Crab Fries express window too. I’ll try to fill these in a little better with menu specifics and prices, as I become more familiar with each stand. The sausages I’ve had have been good. The gourmet burger was good as well–albeit a bit pricey. Grilled chicken skewer was good. I usually find good stuff at the BBQ stand. The pizza was not very good. Restaurants: There are three restaurants “connected” to the arena. That is to say, they are in the arena block. 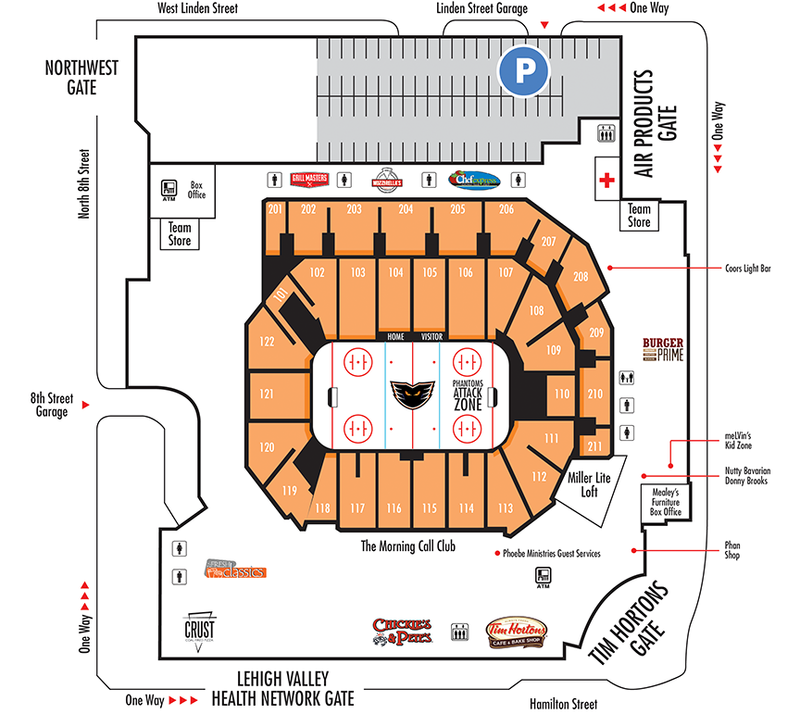 Tim Horton’s (“Timmie’s”) Coffee and Pastries, and Chickie’s and Pete’s Sports Bar have access directly to the concourse of the arena! You can have your ticked scanned for access and re-entry to the concourse. You can take your drink from the bar at Chickie’s and Pete’s in to the arena; however, you cannot take any glass items and they may restrict liquor from the arena if they notice you. The PPL Center does not allow re-entry; however, they may or may not be able to prevent you from leaving via Chickie’s and then returning via the same route. The third restaurant, 99 Bottles, has access outside on Hamilton Street and via the LVHN gate inside. They feature coal-fired gourmet pizzas and other interesting fare. Chickie’s and Pete’s has a more extensive menu than I thought, and is quite large inside. The pre- and post-game TV shows are broadcast from a sound stage near the door. That “studio” is also used for some radio broadcasts at other times. “Chickie’s” gets VERY crowded before a hockey game. If you want to get a table, I’d recommend arriving BEFORE 5:25PM for a Wednesday game, before 5:00PM for a Friday game, and before 4:40PM for a Saturday game–although this may change somewhat with the new 5:30PM door openings for Saturday hockey. All have been accommodating to the jersey wearing hockey fan. They’re just happy to have folks downtown with money in their pockets. Check on which ones take reservations, and which are closed on Sundays. Finally, please note that there is no tailgating in the city-owned lots. You might get away with having a beverage or a sandwich near your car, but I bet if you put up a tent and pull out a grill, you’ll attract some of that ubiquitous security I spoke of a few paragraphs back. 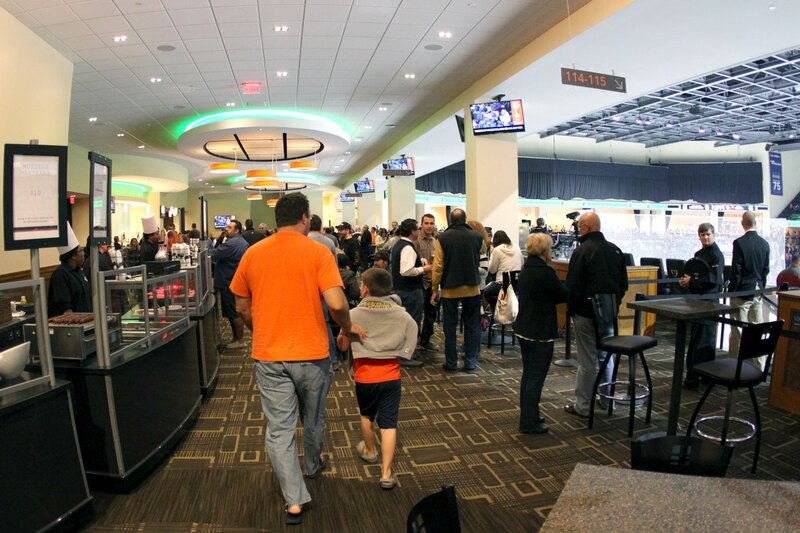 Beer and Adult Beverages: There are many, and varied beer choices about the arena. When I have time, I’ll try to map them all out for you. However, Miller Lite is widely available, as is Bud Light. Coors Light is available, too. Local favorite Yuengling Lager is widely available. Micro-brews and imports are about, as well. 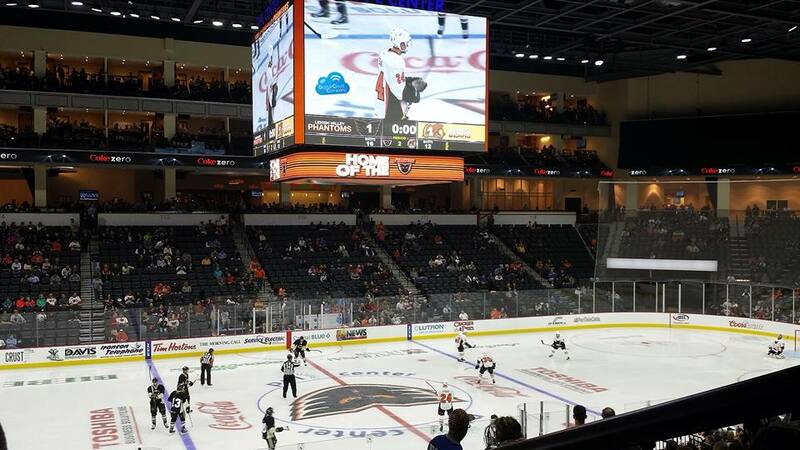 During Phantoms hockey games, 24 oz domestic drafts are $8.50 in 2015-16. They haven’t been filling them to the top, so that’s a potential problem. 16 oz micros and imports are $8. 16 oz cans of Bud Light or Miller Lite are also $8, while 12 oz bottle are $6.50, I believe. 24-oz “bomber” cans are becoming more widely available throughout the concourse and via roving “beer men”. On the domestic side, you can find Bud Light, Miller Lite, Coors Lite, and Lager. For imports, I’ve seen Labatt’s, Blue Light, Molson Canadian and Heineken. They are $9 for domestic and $11 for imports. Wine and liquor are available up at the Miller Lite Loft, as well as at the bar in Chickie’s and Pete’s–although you’re not allowed to leave those areas with those types of drinks during a hockey game. The wine offerings are pretty pedestrian, but we’re talking about a hockey arena here. For hockey, I believe that beer sales end and the conclusion of the second intermission at all concourse locations–but continue in Chickie’s + Pete’s. 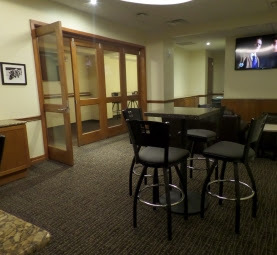 If you are a guest in one of the Suites, you can proceed down the corridor heading East, and through the glass doors to enter the Miller Lite Loft should you need an adult beverage not provided for you in the suite. Otherwise, as mentioned above, access the Miller Lite Loft (‘MLL’) from the stairs to sections 211/210 or C+P from the hall roughly behind the club sections 115/116. Advanced: Things are a little different during concerts: Additional “bomber” choices are available on the concourse–as are beer and wine and mixed drinks at make-shift bars along the concouse. Of course, everything should always be available in the Morning Call Club Section, at the bar. Programs: Most events will have programs for sale. They may be available from vendors throughout the arena, however, they’re almost always available right inside the door at the main entrance at 7th/Hamilton–“Tim Horton’s.” For hockey, the programs are $2. I’ve also seen them at the 8th/Linden gate. Advanced: The hockey programs may be THE SAME for a series of games. So, if you go to a bunch of games or are a season ticket holder, it might not be necessary to purchase one each time. Check the dates written on the cover, and pick up a new lineup card at fan services! Rules and Security: There may be specific rules for some concerts depending on the artists’ wishes. However, in general, the PPL Center does not allow re-entry without an additional ticket. Also, they’ve restricted cameras by saying “no professional lenses” and “no detachable lenses.” There is no smoking at the arena; but they’ve allowed for an area of smoke and re-enter I believe near the Northwest gate (8th/Linden). It opens when the puck is dropped and closes at the end of the second intermission. Bags will be checked on entry, and a variety of other frisking, metal detectors and other methods have been in use. New for 2016-17 are walk-through metal detectors–usually more efficient. It has varied by event thus far, and the staff has been efficient and professional in most cases, but irregularities have been reported. If the security lines are long, make sure to have your pockets free of metal items and your hat off ahead of time. Advanced: Folks I know with semi-professional cameras have been able to get them in, so I don’t think they’re being terribly strict about that definition, above. However, you should have a back-up plan in case you get stopped. And, the standards may change depending on the type of event. I.E. 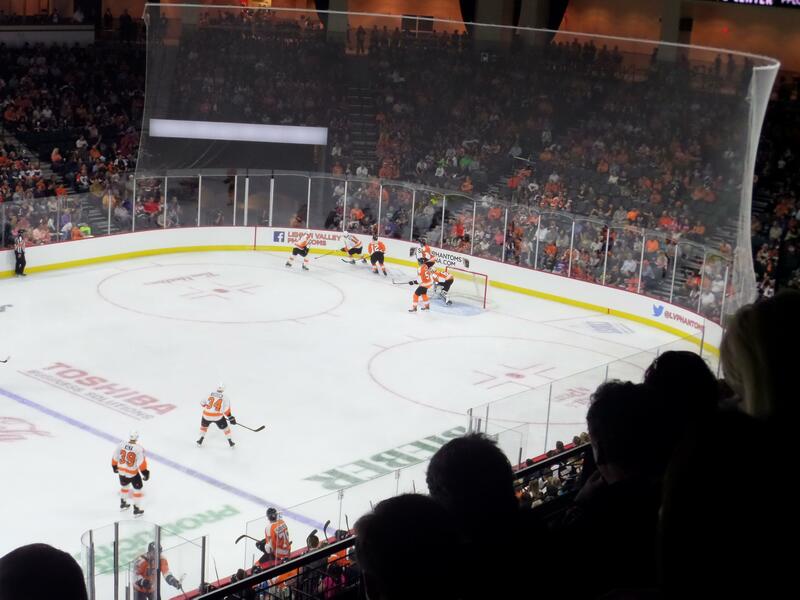 Phantoms games may have a loose definition, where a certain act or musician may want the strictest application of the rule. Be prepared, is all I’m saying. I don’t think they allow large back-packs or bags at any time. New for 2016-17 is a specific size restriction for all bags. Dress Code: There is no specific dress code for arena events. Perhaps you’ll want to dress according to which restaurant you’ll be eating in prior to, or after the game? Or what type of concert or event you’re attending? Otherwise, the thing to keep in mind is that they need to keep that ice suitable for competitive hockey. That means it’s kinda cool in there. In the fall or early summer months when it’s warm outside, you might want to consider a sweater (hey, buy a hockey sweater!) for the games. Other events during hockey season might also have the arena inside temp on the cooler side. Please take that into account when choosing your attire. During the hockey off-season, they remove the ice and it might not be quite as cool. Weather: Of course, the arena is inside, so don’t expect any rain-outs. Even with snow, the events will likely be “show goes on” as long as the performer and/or teams are in town. I’ve found the streets and lots to be well-maintained downtown on snowy days; however, the sidewalks maybe less so–choose your footwear wisely. Internet and Communications: The metal roof of the arena structure, coupled with the surrounding tall buildings, has left the arena bowl and floor with very poor cell coverage. I’ve heard this from both AT&T and Verizon customers. But it’s variable, as some folks with some devices in some seats still do OK. New for the 2015-2016 season is Phantoms Phan Wi-Phi! So far it’s been an excellent addition allowing me to keep in touch and be “on call” for my other commitments while at the games. I imagine it will be available for concert and event-goers as well. The hotel Wi-Fi is sometimes connectable, as is the PTD (Service Electric) public, if you have a password. “Glass” Seats: Sitting “on the glass” is a neat way to watch a hockey game. A season ticket package on the glass at the PPL Center will run you $1220.00 per season on a 3- or 5-year contract for Phantoms hockey. 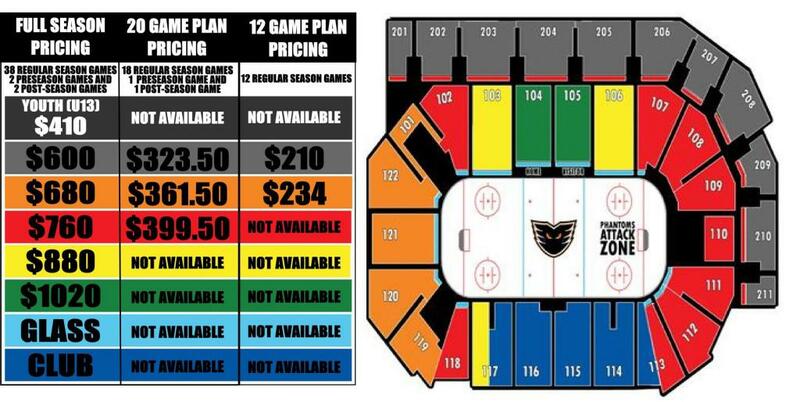 This comes to about $29/game on the 42-game package; the Phantoms have the single-game price for these seats at about $48 (plus fees…). On the secondary market, you might find these seats for $79 each, or so. “Glass” tickets also allow you access to the Morning Call Club area, and may be easy to sell for a small profit on the secondary market. “Club Level”: There’s no “level” for the club. 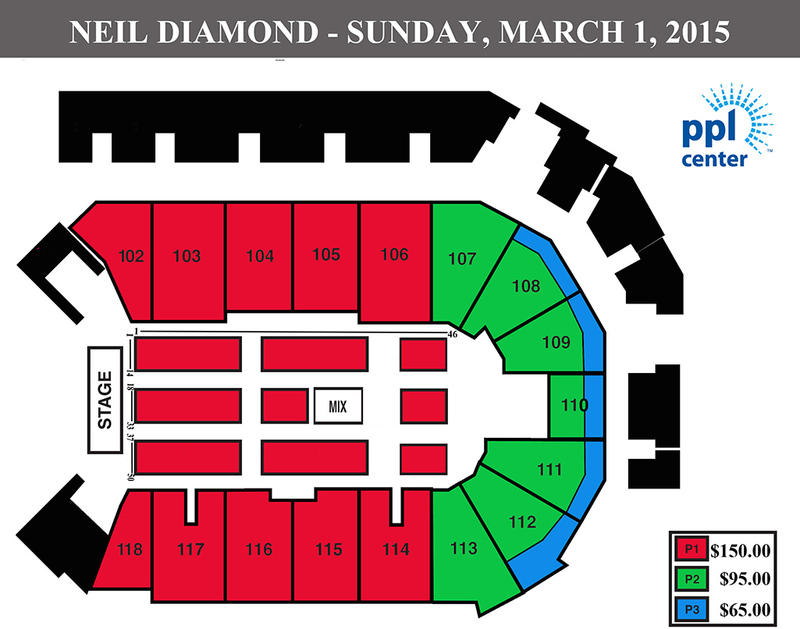 The “Morning Call Club” is located behind sections 115 and 116, and includes the center-ice half of sections 117 and 114 and maybe more–as the latest map I’ve seen has it expanded even further–half way into section 113. The “Club” has it’s own bar, of course, as well as it’s own rest rooms. On the night I was in the club, there were four or five different, special sandwiches available–for $10 each–at the Club concessions. Tables and chairs and flat-screens are about, as in other club-levels in arenas and stadiums. You can access the club only with an appropriate ticket, near the rear of section 113 at the main entrance, or via the concourse at a door at the rear of sections 116-117. The seats in the club sections are slightly larger and slightly further apart. . On a season-ticket basis, seats in the Club cost roughly $42/seat/game. 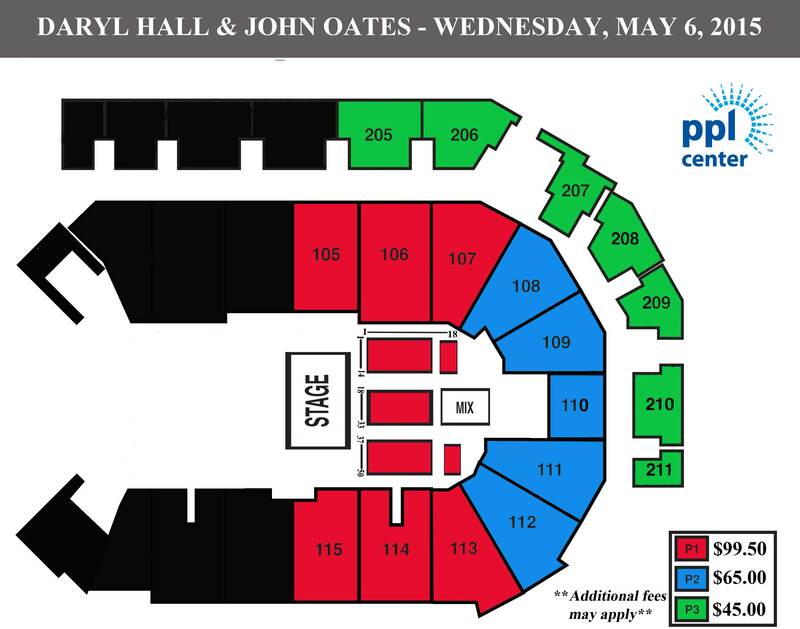 I believe they are sold out, but they do provide for “right of first refusal” on ALL arena events–kinda nice. On the secondary market, you can purchase them for around $65 each for hockey. It is NOT easy to see the ice from within the club. The areas directly behind the Loge Boxes have been roped off, so you must either go to your seat, or watch via the big boards or the flat screens. Advanced: “Loge” boxes are located at the rear of the club sections. Mostly, they are leased by companies like the luxury boxes up above. However, some may be available for per-event lease. They have available catering, and wait staff, large leather-like chairs, and private flat-screens–but are small, perhaps only 5-10 seats each. Ice-level “bunker” suites are located down below the club section, and are probably most easily accessed by elevator should you have a ticket for one. 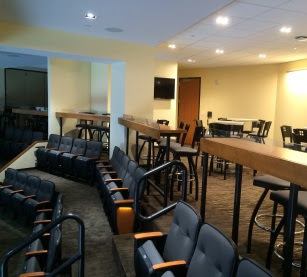 These suites provide NO view of the ice or arena stage; however, they include club section seating via the two mini tunnels in section 114 and 117, right near the ice. There are nice lounge areas down there, as well as some game-room-type things like foose-ball and rod-hockey. The suites themselves have VERY large flat screens for enjoying the action without being in your seat. Group Areas and Suites: I believe groups will be hosted in sections 208 and 202 in most cases. In addition, there are some premium locations you can rent on a per-game basis. “Party Suites” of a couple styles. The BSI Ice Suite is located near the East tunnel, where the players enter the ice. Group guests can greet the players on the way to the ice! The buffet and group area is underneath section 109, with glass-side access in front of section 108 and 109. They are able to accommodate large groups there. Luxury boxes up above sections 112 and 113 are expandable to provide for varying sized groups. Prices may vary depending on the type of event, but 26 tickets for a regular season hockey game will run approximately $1400.00. And, that doesn’t include the catering, which has to be purchased from the arena catering service. The catering menu is very nice, though, and not overly expensive considering the ticket prices and other arena food options. Suite rentals also include a certain number of parking passes in the arena garage. How many seats are in each row on the floor at Shania Twain concert in October? I’m not sure Donna. By memory, from the Eagles concert, seemed like about 12-15–but I could be wrong and setup could be different. 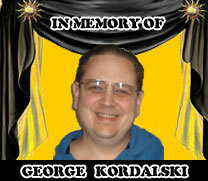 My husband mentioned wanting to go to a phantoms game with some of the guys from his hockey team. I’m thinking of getting him 4 tickets for Christmas. Can you recommend the best section for me to get? I’m not really a sports girl so I am in foreign territory. Excellent question, and there are many ways to answer. The least expensive seats in the arena, for hockey, are in section 201, the “Capital Blue Cross” section in the upper/corner. If these are available, they are only $10 (PLUS FEES). I have sat in that section several times and felt I could see the game just fine. It’s a cliche, I know, but because the arena is small compared to Philly or New York, there really aren’t any bad seats. Demand for hockey tickets is high, and you might be limited by what is available, depending on when you purchase them. Another section which is usually available is 210. The seats are at the end of the ice and allow you to see the entire ice all at once. 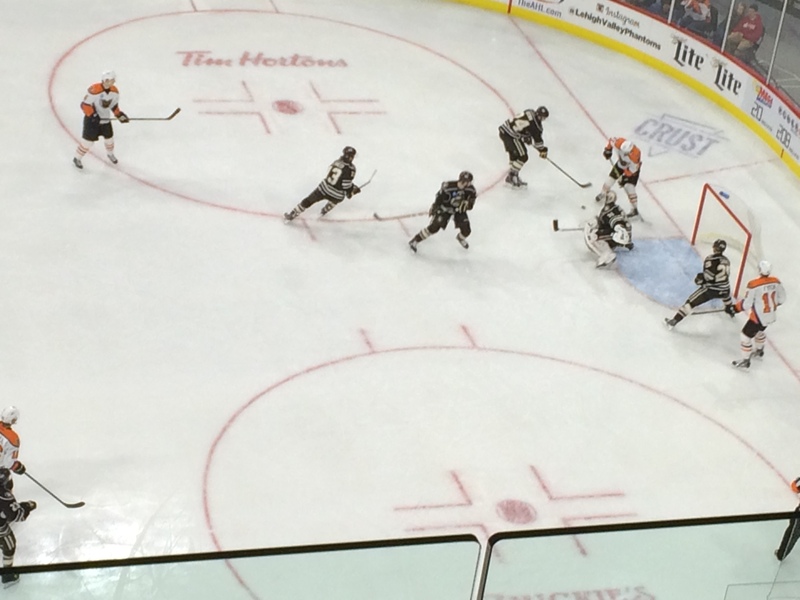 The Phantoms shoot twice towards that goal–right in front of you! Plus, it’s near the Miller Lite Loft bar and the “rotunda” at the bottom of the steps. It’s a great location and is usually available. 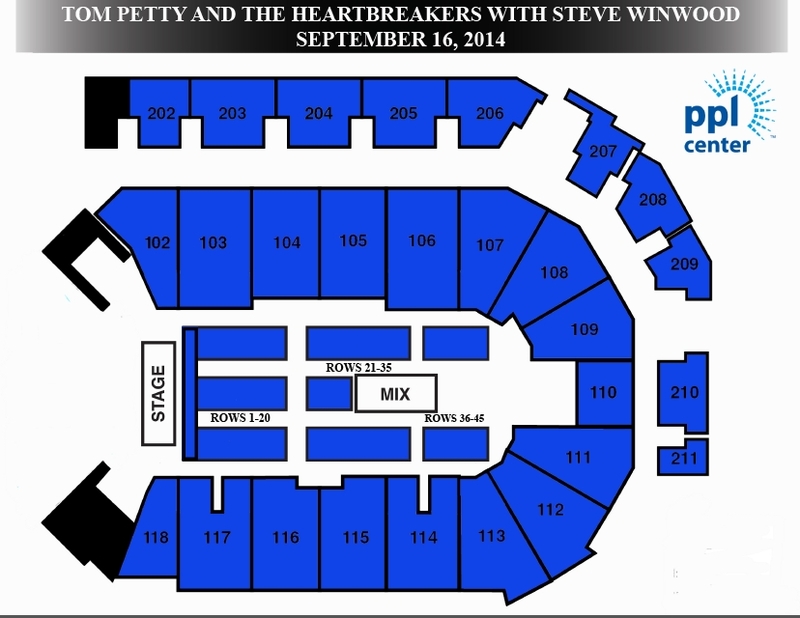 You might be able to find seats at one of the blue lines–sections 103 or 106. Those are good seats as well as the ones above them in the upper level. Finally, if you want to go “all out” consider scouring the secondary marked (ie StubHub, SeatGeek) for “club” seats or “glass” seats. Seats in the “Morning Call Club” sections 116-114 include access to the bar and club amenities behind above and behind the seats. “Glass” seats are, of course, right on the “glass” in the first row. Plus, glass seats also allow you to access the Club for eating, the bar, and relaxation. These seats are all sold out, of course, but there might be folks re-selling them if they can’t make it. You’ll pay a pretty penny, though, probably. Good luck, I know he’ll love it! I tried to get in last night for what was essentially my daughters Christmas ice skating program with a micro 4/3 camera – think interchangeable lens, palm of your hand, about the size of a point and shoot turned on with the lens out – I was refused entry and had to walk all the way back to my car to lock it there. I’m a professional photographer (reading this I left the Nikon D4s at home). Coca Cola Park is camera friendly. PPL Center is NOT. PS I emailed guest services several days prior to the event. I never received a response. I’m sorry to hear this John. 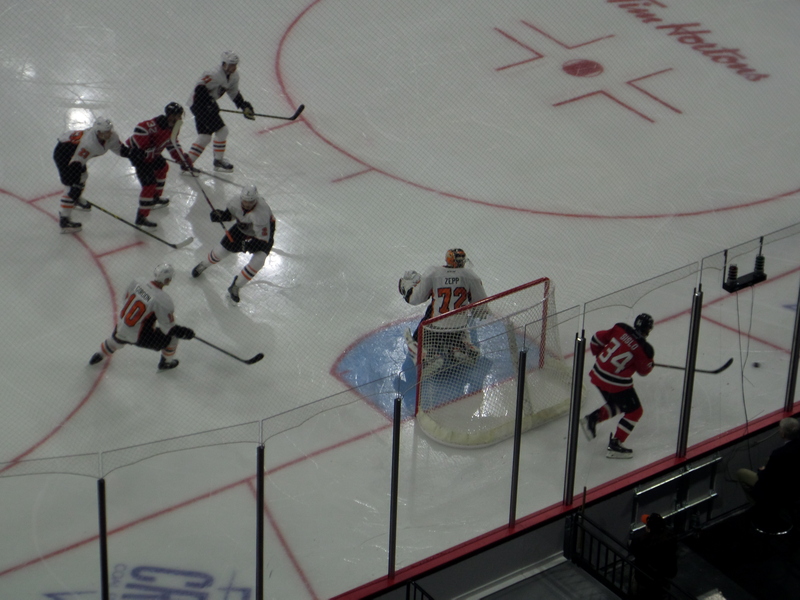 In past hockey seasons I’ve been able to get my big Nikon super-zoom in, but it doesn’t have interchangeable lens. Haven’t tried recently. I don’t like the rule and I’m not sure I understand the reason for it or why they draw the line where they have. do the metal detectors use non ionizing radiation or ionizing radiation? I do not know. Standard walk-through detectors now–perhaps call and ask for someone in security. I saw someone ask to be wanded the other day so you can do that too.